Of all the sources of structural variability in proteins, the hardest to pin down is side-chain conformational heterogeneity. Side chains aren’t always easy to model into their primary conformation in the first place — you need excellent crystal diffraction or NMR data to do it. Even if you pulled that off, it’s not always clear how (or if) side-chain fluctuations relate to a protein’s activity. If we carefully examine our data for the faintest signals, however, we can sometimes find evidence of secondary conformations that play an important role in function. In an article in this week’s Nature, James Fraser, myself, and others show that in the case of the proline isomerase cyclophilin A (CypA), alternative conformations of side chains play a key role in catalysis. Previous experiments on CypA had established that the backbone amide groups of many residues were sensitive to a conformational fluctuation on the millisecond timescale. Under conditions where this enzyme is saturated with a peptide substrate, the fluctuation rate for some of these residues is very similar to the catalytic rate, suggesting that the dynamics and catalysis are linked in some way (2). Later experiments also showed that this fluctuation was an intrinsic property of the enzyme, continuing even in the absence of substrate (3). What we didn’t know, however, was how the dynamics of cyclophilin were related to catalysis. We couldn’t know, because we had no idea what the motion we were detecting was. In the case of enzymes like adenylate kinase, there is a dramatic rearrangement of structural elements, and the population of conformations corresponding to the “end points” of that motion can be significantly enriched by altering the amount of substrate present in solution. In the case of CypA, neither of these things seems to be true. Supplementary Fig. 1a (freely accessible from the article page) neatly encapsulates the problem. For this figure, 48 structures of CypA, some with ligand and some without, were aligned, and the variation between them was determined. While there is some variability in the chain conformation, it is primarily limited to a group of residues known to undergo fluctuations that are not related with catalysis (blue chain). The residues involved in the catalysis-related dynamics don’t seem to have much variability, even across this fairly large group. So we can’t trap the unknown, minor state of CypA by adding substrate, and there’s no evidence of an alternate state that explains the NMR data. Knowing this, we suspected that some kind of side-chain motion accounted for the observed dynamics, probably involving an aromatic group of some kind. Our efforts to gather evidence for this, however, ran into some typical NMR problems — resonance overlap and poor sensitivity exacerbated by chemical exchange. Fortunately, the crystallographers came to our rescue, in the form of Tom Alber and his super-talented grad student Jaime Fraser. Jaime had determined a crystal structure of CypA at cryogenic temperature and analyzed the data using their algorithm RINGER, which examines electron density below the threshold typically considered “noise” in order to identify possible alternative rotameric states of side chains. He found evidence of multiple conformations for a few residues, but nothing that would explain the NMR results. Jaime had the bright idea to redo the experiment at room temperature, which Tom was convinced would result in nothing more than a radiation-damaged crystal and bad diffraction data. What actually happened was that when Jaime examined the electron density from that experiment he could identify a group of side chains that had more than one conformation in the crystal, which you can see in Fig. 1. These residues included serine 99, methionine 61, and the catalytic arginine 55. Right in the middle of this group was phenylalanine 113, a residue with an aromatic side chain capable of causing changes in chemical shift at relatively long range. For context, the image to the left shows a structure of cyclophilin (PDB code: 1RMH) in complex with the model substrate we used in our own experiments (succinyl-Ala-Ala-Pro-Phe-p-nitroaniline), with the side chains of S99, F113, M61, and R55 in red. As you can see, F113 and M61 form part of the floor of the binding pocket, with S99 rather remote. So here we have an alternative structure of CypA, hidden below the threshold typically considered when determining a crystal structure. It was certainly plausible that fluctuations in this ensemble of side chains could give rise to the NMR observations, but plausibility isn’t proof. One way to address this would be to try and force CypA to adopt the less-populated conformation. If you look at Fig. 1d you can see that the two conformations of S99 lie at the standard rotameric positions, and that the less-populated rotamer of S99 would run into the more-populated rotamer of F113. So, if you replaced one of the side-chain hydrogens of S99 with a methyl group (i.e. mutated the serine to threonine), that might push the other residues of this group into their minor conformational state. So, that’s what we did. To the right you can see an overlay of structures for wild-type (WT) CypA (red) and S99T (green), aligned using structural elements on the opposite side of the protein from the active site. As you can see, the backbone traces match very closely, except for the helix and loop on the right. These elements are involved in crystal contacts in the S99T structure, but not the WT; a lower-resolution structure of S99T shows no differences here. Another key difference between these structures, of course, is the position of the side chains (thick neon); as shown here (and more clearly in Fig. 2c) they seem to have adopted the minor conformation from the WT structures. Although this mutation inspires widespread chemical shift changes (Fig. 3a) consistent with the hypothesis that this concerted side-chain rotation gives rise to the NMR observations, the structures seem very similar. Yet, S99T CypA differs from WT in two important ways. The first difference is that the conformational fluctuations are dramatically slower, but only for residues that showed catalysis-related dynamics in WT (Fig 3d). In fact, this rate is now so slow that due to a quirk of NMR we can only determine the slowest rate of the process. At 10 °C, this fluctuation in S99T is about 60 times slower than the slowest process in WT. The second key difference between the mutant and the WT is that catalysis is dramatically slowed. Because CypA does not consume its substrate (it acts on both cis- and trans- proline bonds) its activity can be assayed by NMR, as you can see in Fig. 4. As with any enzymatic assay, the net activity is proportional to the amount of enzyme added, so just glancing at these spectra (and knowing the enzyme concentration) you can estimate that S99T has at least 40-fold lower activity than WT enzyme. If you actually perform the fits, it turns out that the reaction velocity for S99T is about 240 times lower than that for normal CypA, but this includes a contribution due to the fact that S99T does not bind its substrate as tightly either. If you correct for this, it turns out that S99T has about 70-fold less activity than the normal enzyme. Not only is this similar to the change in dynamics, it’s also quite comparable to another mutation, R55K, that removes a group that performs some of the chemistry. 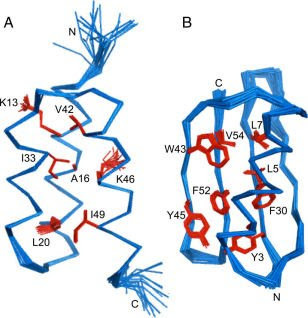 These results indicate that a conformational change in a group of side chains including F113 is primarily responsible for the chemical exchange behavior observed in WT. The S99T mutation stabilizing the minor conformation dramatically and similarly reduces both the conformational fluctuation rate and the catalytic rate. This suggests that dynamics and catalysis are linked not by happenstance but by some direct relationship. Unfortunately, these experiments do not provide any direct insight into the mechanism by which dynamics contribute to catalysis. They do establish, however, that in CypA coherent fluctuations of side chains, barely detectable in protein crystals, nonetheless make a critical contribution to function. Where do new enzymes come from? Biochemists often rave about the great wonders of enzymes, lavishing praise on the prodigious rate enhancements they produce, and their exquisite positioning of functional groups. One can quite reasonably ask how such magnificently useful proteins came into being. One accurate answer, of course, is that after a couple hundred million years evolution can get almost anything right. Another answer is that most enzymes come from other proteins, via a process called gene duplication. The genetic changes that follow one of these duplications turn two copies of one protein into two completely different proteins with diverse activities. It may seem incredible that a vast diversity of protein structures and activities can arise simply by making copies, even imperfect copies. However, certain quirks of the translation machinery mean that small changes in DNA can amount to enormous changes in a protein’s topology. For instance, an insertion or deletion of a single base can cause a frameshift mutation, producing a protein that bears no resemblance to its progenitor despite having only 1 different base pair. Many DNA triplets that normally encode amino acids are only a single base-pair mutation away from becoming a stop codon, truncating a protein and likely changing its structure significantly. Similarly, stop codons can be easily eliminated, producing much larger proteins. In eukaryotes, point mutations near the borders between introns and exons can cause new regions of DNA to be translated into protein. Of course, drastic changes like these mostly just produce useless junk, but occasionally a novel fold or function arises. More conservative alterations of a gene sequence can still produce significant changes. As I’ve mentioned before on this blog, some members of the Cro family of proteins have very high sequence identity and yet possess different structures. I also have not yet tired of reminding you that the chemokine lymphotactin has two different structures with a single sequence, either of which can be stabilized into an exclusive fold by a point mutation. Additionally, research from the lab of John Orban shows that a mere 7 mutations are required to convert the engineered protein GA88 (PDB) into a completely different structure, GB88 (PDB) (1). 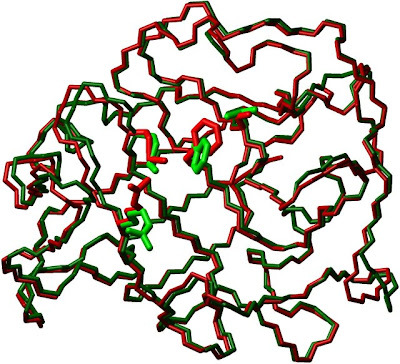 These proteins were previously shown to have different folds and functions, but the contrast between the high resolution structures (shamelessly stolen figure on the right) is striking. Moreover, the Orban lab has refined this system so that the structural conversion can be effected with only three mutations, rather than seven. What all this research indicates is that the transitions that convert a sequence from one fold into another may be sharper than previously realized; even a relatively small number of fairly conservative mutations may be able to completely transform a protein’s structure. The advantage of this model, from an adaptationist’s perspective, is that it brings selective pressure to bear at every step. Once a new function has evolved in response to environmental conditions, duplicating the gene may provide an organism a concrete advantage. After duplication, the advantage of separately refining the two activities is obvious. The two models are not as different as they might seem at first glance, because nearly every enzyme catalyzes two reactions anyway, that is, the forward and reverse reactions of an equilibrium. A “new” activity for a given enzyme can therefore result from something as simple as being targeted to a different cellular compartment or a change in specificity that involves an oppositely-oriented equilibrium. The most obvious objection to the latter model is that during the period of gene sharing prior to duplication, neither protein function will be very efficient. As a matter of fact, the appearance of a new activity does not always impair an enzyme’s ability to do its original job (and indeed can even enhance that activity). Still, because of the exquisite tuning of enzyme active sites we can expect that many modifications to this region will reduce catalytic power. That being the case, how might an organism survive or thrive during the gene-sharing period? The answer, which always seems obvious in retrospect, is to make more of the less efficient enzyme, as was demonstrated in a recent paper by Sean Yu McLoughlin and Shelley Copley (2). McLoughlin and Copley took a strain of E. coli that lacked an enzyme, ArgC, that is critical for glucose metabolism. They treated these bacteria with a strong mutagen and then picked a colony that grew well on uncomplemented glucose. 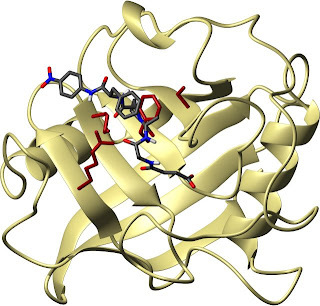 After showing that these bacteria had developed a novel activity equivalent to ArgC, they isolated the “new” enzyme and found that it was actually an existing enzyme, ProA, which performs similar chemistry. This enzyme had gained the ability to take over the tasks of the missing ArgC, enhancing the rate of that reaction 12-fold. The actual chemistry of these reactions was quite similar, but in gaining the ability to operate on ArgC’s substrate, the activity of ProA towards its own substrate was reduced 2800-fold. The bacteria compensated for this by upregulating the production of the enzyme. A second mutation in the promoter region of the gene was helpful, but not necessary, in this respect. Because enzymes are catalysts, a small increase in protein concentration can result in a significant increase in the availability of the reaction products. Biochemists often say, seeing a 3000-fold reduction in activity, that an enzyme is dead. The reality is that it’s just slower, and a living thing can compensate for that in ways not available to an isolated reaction in a test tube. Organisms have shown that they have ways to survive what an enzymologist might see as fatal. Of course, modern bacteria benefit from a number of well-tuned regulatory and feedback mechanisms that allow them to sense when particular metabolites are running low and to increase the production of proteins that can replenish them. Earlier, more primitive organisms might not have had these expedients available. Could they have survived gene sharing? Too little is known about early life forms to answer such a question definitively. However, it is interesting to note that one method of making more protein is to make more of the gene. That is, the concentration of a deficient enzyme can be increased via gene duplication. By a fortuitous coincidence, a single mechanism could both enable an organism to tolerate reduced enzymatic efficiency and allow the evolutionary process to independently refine its activities. It is also worth bearing in mind that just as ancient organisms did not necessarily resemble modern ones, ancient proteins might not have resembled the modern item. The exquisite positioning of functional groups that characterizes modern enzymes requires a rigid fold and contributes significantly to the rate accelerations they produce. However, substantial rate enhancements can still be achieved in the absence of a stiff native state. One occasional result of mutations is the formation of a molten globule, a protein that lacks a stable fold but still exists in a collapsed state with something resembling a hydrophobic core. Although that doesn’t sound particularly useful, many molten globules have enzymatic or other functional activities. Recent computational studies on a molten-globule mutant of Methanococcus jannaschii chorismate mutase suggest that realistically low energy barriers can be achieved by a broader array of structural states in these proteins (3). Researchers from the lab of Arieh Warshel used a simplified model to sample the conformational space available to the molten globule enzyme (mMjCM) and a stably folded form of the enzyme (EcCM). As you might expect, the lowest-energy conformations are much more diverse for mMjCM than for EcCM. Roca et al. then computed the energy barrier for catalysis for conformations that closely resembled the ideal structure (region I), conformations which had most of the groups in the right general position but were significantly removed from the ideal (region II), and conformations that did not resemble the ideal at all (region III). For EcCM, only structures in region I had energy barriers low enough to plausibly allow catalysis. The molten globule, however, had energy barriers that would allow catalysis in region I and region II. You can see this in the figure below, which I shamelessly stole from their paper: the dotted orange line corresponds to a 16 kcal/mol energy barrier, what they felt to be the largest barrier reasonable for a catalyst. The results for mMjCM are on the left, EcCM on the right. The upshot of this is that molten globules may be able to maintain catalytic power in the face of structural diversity that causes folded proteins to fail. While the stable fold produces greater rate enhancements (note that EcCM has lower energy barriers), the molten globule tolerates a wider array of structural conditions. Consequently, proteins of this kind may be much more amenable to the addition of new functions. So long as an appropriate orientation of functional groups is reasonably likely, a protein without a rigid conformation can still achieve impressive rate enhancements. Conceivably, an early molten globule enzyme could have the ability to catalyze several different reactions, switching between the required conformations as needed, without a significant loss of catalytic power to any of them. Duplication of a multi-functional molten globule like this would allow each chemical function to be refined independently, with additional duplications and refinements giving rise to substrate specificity. The different models of gene duplication each have their own explanatory advantages, and the available evidence suggests that new proteins and enzymatic activities have evolved (even within the last century) using both routes. As this is one of nature’s favored methods of generating novel activities, so it is becoming ours. The artificial enzymes recently produced by David Baker’s lab were designed onto an existing protein scaffold in what could be taken as a computational mimicry of the gene duplication process. In addition to the adverse consequences of addiction and the inconvenience of serving several years of jail time for possessing it, cocaine can cause a fatal overdose. Although this condition can be treated, no therapy presently exists that attacks the overdose by removing cocaine from the bloodstream. One possible approach to eliminating cocaine from a patient would be to accelerate the process by which it is degraded. Unfortunately, the enzymes that perform this activity in the human body are not very efficient. In an upcoming article in the Journal of the American Chemical Society, however, a group from the University of Kentucky (assisted by researchers at the University of Michigan) have remodeled the active site of butyrylcholinesterase (BChE) to achieve a 2000-fold increase in rate. This raises the possibility of producing therapeutic enzymes as a treatment for cocaine overdose. A cocaine overdose typically results in an elevated pulse rate, seizures, and hyperthermia, among other possibilities. The usual course of treatment involves addressing the symptoms — diazepam to reduce the heart rate, cooling protocols to address hyperthermia. These steps are proven to work, but they don’t address the core problem: there’s still a lot of cocaine floating around in the bloodstream. Treating with sedatives amounts to using one giant truck to stop another giant truck… both trucks will probably stop, but there might be a lot of collateral damage. Instead, it would be advantageous to either block the receptors that cocaine binds, or clear cocaine from the bloodstream somehow. Plasma butylcholinesterase does most of the work in metabolizing cocaine, by cleaving it into two products that no longer exert the same pharmacological effects. If BChE was a highly efficient enzyme it’s unlikely that people would experience cocaine overdoses at all, but it breaks down the main form of cocaine quite slowly, with a catalytic rate (kcat) of 4.1 /min, resulting in a very long half-life for this substrate. The chemical mechanism of BChE (Figure 1) will be familiar to anyone who has taken biochemistry, being basically the same as a serine protease. Instead of a peptide bond, however, it is the ester linkage of cocaine that undergoes nucleophilic attack from an activated serine, while hydrogen bonds stabilize the evolving negative charge in an oxyanion hole. Previous efforts to optimize the activity of BChE by mutation focused on eliminating steric clashes, but Zheng et al. noted that the hydrogen bond lengths in the oxyanion hole were not optimal for stabilizing the putative transition state. They therefore decided to focus their efforts on improving the energetics of this region. To do so, they used combined quantum mechanics/ molecular mechanics (QM/MM) simulations to determine the energy barriers in simulated reaction coordinates for a number of different mutants. This has the advantage of screening potential mutants for a specific effect, which may be quicker than wet lab work, but it requires the researcher to know the catalytic mechanism and to define a region of interest in advance. By working through a series of mutations, Zheng et al. arrived at one multiple mutant of BChE that had favorable interaction energy for every residue in the oxyanion hole. When they generated this mutant in the lab, they found that it had a vastly increased catalytic rate towards cocaine, with kcat now about 5700 /min. Based on these in vitro results they decided to test the mutant BChE in vivo using mice. They found that injecting mice with 30 µg of BChE protected them from seizure and death due to cocaine overdose. While the n for this experiment is small, and the BChE was injected prior to cocaine exposure rather than after, these results suggest that the mutant BChE has potential as a therapy for cocaine overdose in humans. Obviously, further improvement would be needed before these protective effects could be realistically equaled in humans. To match the dose used in this experiment, a 180-pound man would need to be injected with 82 mg of the protein, which is a rather large amount. However, if used in conjunction with existing treatments, the required dose of BChE may be lower. If not, then translating these results into a useful therapy will require either further catalytic optimization or an enormous production effort. A significant amount of additional clinical research is required before this or any other mutant of BChE is introduced as a therapy for overdose or addiction. Nonetheless, these results illustrate the promise of enzyme optimization and design as a tool for medicine in the future. Like many bachelors, I regularly eat meals heated up in a microwave oven. I’d like to think I eat a somewhat lower percentage of frozen dinners than others in my situation, but even when it comes to food I cooked myself I usually don’t have the time or patience to cook a recipe for one every night. That means I’m often eating reheated leftovers from the trusty Radar Range. The microwave oven works using dielectric heating, a process in which the movements of dipolar bonds are coupled to an oscillating external field. Water, for instance, is a molecule with a large dipole moment, and when you cook something in a microwave a lot of the heating occurs by the accelerated movements of water molecules. In principle this kind of excitation should also occur for other kinds of polar molecules, and thus we come to an interesting study from the lab of Alex Dieters, in which microwave radiation was used to activate a cellulase from a hyperthermophile. Protein backbones consist of series of peptide bonds which include a carbonyl group, a classic example of a polar bond. Naturally, one might expect that the motion of these groups would be excited by microwave radiation. However, it does not directly follow that additional motion of the peptide backbone will actually accelerate chemical reactions, because this motion may be chaotic or unproductive. Moreover, from the fact that microwaves cook things (like eggs), we know that microwave radiation does a good job of denaturing proteins, sometimes at lower temperatures than we expect. Both of these problems can conceivably be avoided by studying a hyperthermophilic protein. Proteins from hyperthermophiles such as Pyrococcus furiosus tend to be stable and optimally active at very high temperatures, at or even exceeding the boiling point of water. At lower temperatures, they retain their stability, but tend to become inactive. In many cases this reduction in activity appears to result from squelching internal motions that may be necessary to bind or properly orient substrates. Young et al. decided to study the β-glucosidase CelB from P. furiosus as a way of understanding whether microwaves might enhance enzymatic catalysis. Because CelB has optimal activity at 110° C it should be possible to see a significant difference in activity if microwave activation works. The stability of this protein at high temperatures also suggests that you will not accidentally cook it. Sharp readers will have noticed an obvious problem with this idea—because heat activates this protein, and microwaves heat aqueous solutions, we must incorporate some kind of control in order to determine the pure effect of the radiation as opposed to the temperature. Young et al. resolve this problem by monitoring the heating of the sample during microwave irradiation, and then using a normal thermal apparatus to match this temperature profile (Figure 2). When a reaction reached 40° C using either heating method, it was quenched by the addition of a basic solution and the concentration of products was measured. Simply heating the Pfu CelB reaction to 40° C produced negligible activity, but microwaving it increased the activity by 4 orders of magnitude (i.e. a factor of 10,000). Less dramatic, but still significant, effects were observed for two other hyperthermophilic enzymes, but an enzyme from a mesophilic organism (the almond) was not activated by microwave irradiation. That the microwaves caused increased backbone motion was supported by the finding that irradiating Pfu CelB at 75° C caused it to denature; this temperature is well below the normal melting temperature of this enzyme (115° C). The authors attribute the differences in activation between CelB and the other hyperthermophiles to their lower optimal activity temperatures, but it is also possible that the particular motions enhanced by microwaves are simply not as productive in those molecules. Although all the dipoles should be affected in similar ways by microwaves, they are all oriented differently with respect to each other in the protein molecule. As a result, the induced motion may be chaotic, perhaps specifically so, and therefore the activation of a particular thermophile may depend on the nature of the motions needed for its catalytic cycle. Enzymes that require large ensemble motions of subdomains, such as adenylate kinase, might not be activated as much as a protein that simply needs to be melted a little. Examining the differences in structural dynamics of enzymes differentially activated by microwaves may be an interesting area of future study. While microwave activation is unlikely to revolutionize some of the more common uses of hyperthermophilic proteins (i.e. PCR), it does have promise. In ligations, for instance, hyperthermophilic enzymes can not be used at present because many DNA inserts denature at the optimal active temperature. With microwave activation, it may be possible to employ extremophilic ligases in these reactions, gaining the benefits of their speed and durability without having to worry about accidentally melting your DNA. Depending on the enzymes available, this technique may also prove valuable in improving mobile medical laboratories and developing novel diagnostic tools for field work.